HAVANA Former Venezuelan Vice President Elias Jaua said Sunday that he met with aging revolutionary icon Fidel Castro for five hours and showed The Associated Press photos of the encounter, quashing persistent rumors that the former Cuban leader was on his deathbed or had suffered a massive stroke. Jaua showed a photograph of himself seated in a minibus along with the former Cuban leader, Castro's wife, Dalia Soto del Valle, a hotel executive and several other people. 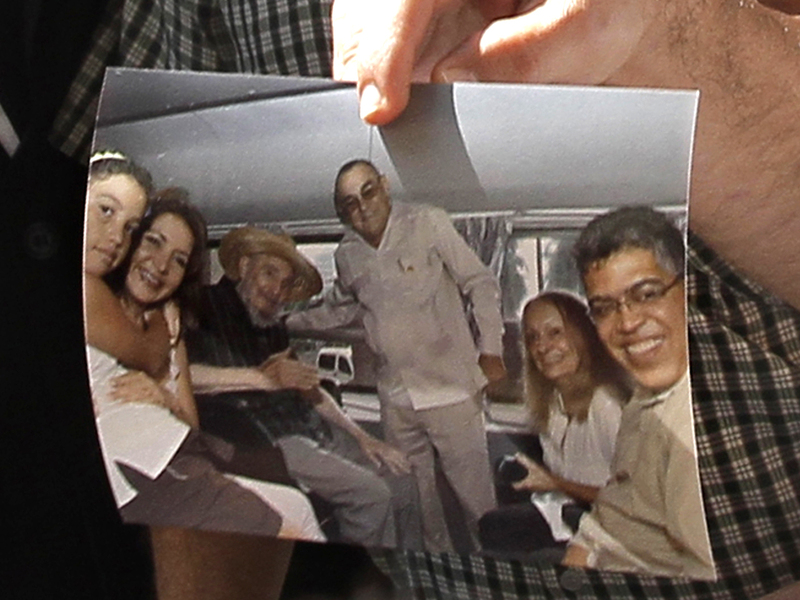 The photo shows Jaua and Castro smiling broadly, and the former Cuban leader is wearing a checked shirt and cowboy hat. The public appearance was Castro's first in months. A top Hotel Nacional executive told the AP earlier Sunday how Castro had dropped off the Venezuelan guest, then stayed on to chat with hotel staff. "Fidel Castro was here yesterday, he brought a guest and spoke to workers and hotel leaders for 30 minutes," commercial director Yamila Fuster said. Fuster was not present, but hotel director Antonio Martinez is seated next to Castro in the photo shown by Jaua. Castro's health has been the subject of intense speculation for years, but the rumors gained force in recent days after he failed to publicly congratulate Venezuelan President Hugo Chavez, a top ally, on his Oct. 7 electoral victory. The former Cuban leader has not appeared since March, when he was shown greeting visiting Pope Benedict XVI, and he has also ceased writing his once-constant opinion pieces, the last of which appeared in June. Twitter and other social media sites have been abuzz with claims of Castro's demise. Late last week, a Venezuelan doctor purported to have information that Castro had suffered a stroke, but the same doctor has previously claimed knowledge that turned out to be false. Sunday's news from the Hotel Nacional appeared to be Cuba's attempt to hit back against what it says are false and malicious rumors. A letter attributed to Castro was published Thursday by Cuban state media. In it, he congratulated graduates of a medical school on the occasion of its 50th anniversary. Two close family members of Castro have also recently denied he is in grave condition. Juanita Castro, the former leader's sister, told the AP in Miami that reports of her brother's condition are "pure rumors" and "absurd."